The Triassic (251-199 million years ago) was an interesting time in the history of the Earth. Just after the largest mass extinction in Earth’s history (the Permian Mass Extinction at 252 million years ago), the Triassic was a time when new animals were starting to take over. The weird looking synapsids (distant relatives to mammals) were gone and early archosaurs were emerging. Fauna of the Late Permian. From Pinterest. Fauna from the Triassic. By deviantART user Apsaravis. 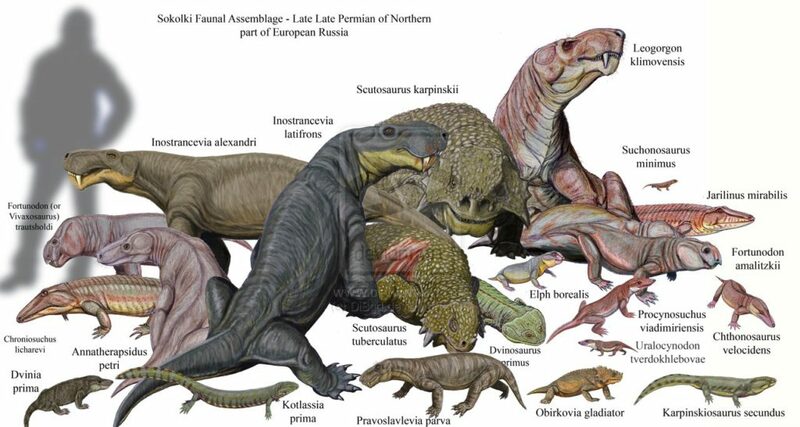 These archosaurs eventually divided into the Pseudosuchian (archosaurs closer to crocodylians: rauisuchians, thalattosuchians, aetosaurs, modern crocodylians, and more) and Avemetatarsalians (archosaurs closer to birds: pterosaurs, ornithischians, sauropods, theropods, and more). Understanding what these early Avemetetarsalians looked like has been difficult because complete, well-preserved specimens from the Triassic are hard to find. Other animals on these lineages that we do find are already very advanced: for example, early pterosaurs already look like pterosaurs. An early pterosaur, Dimorphodon. From Wikipedia. A new [paper] published this week described an early avemetatarsalian that they named Teleocrater rhadinus (Teleo – closed and crater– basin after the closed hip socket, and rhadinos – slender, for the animal’s slender body). It was found in Tanzania and it is from the lower portion of the Middle Triassic rock layers (247-237 million years ago), making it one of the oldest members of this group. The specimen has most of the limbs, some vertebrae, and a bit of the skull. Figure 2 from the paper showing the Teleocaster specimens. Red bones are present in 1 individual. Blue bones are present in the second individual. Purple bones are present in both. The bones of Teleocrater tell an interesting story. The way the ankle bones are shaped and the way they fit together is very much the same in this early avemetatarsalian and in early pseudosuchians. This means that the ankle seen in pterosaurs, dinosaurs, and one other group was evolved multiple times instead of just once for the whole group. Other features indicate that these early avemetatarsalians were long-necked, carnivorous, and not built for efficient running. 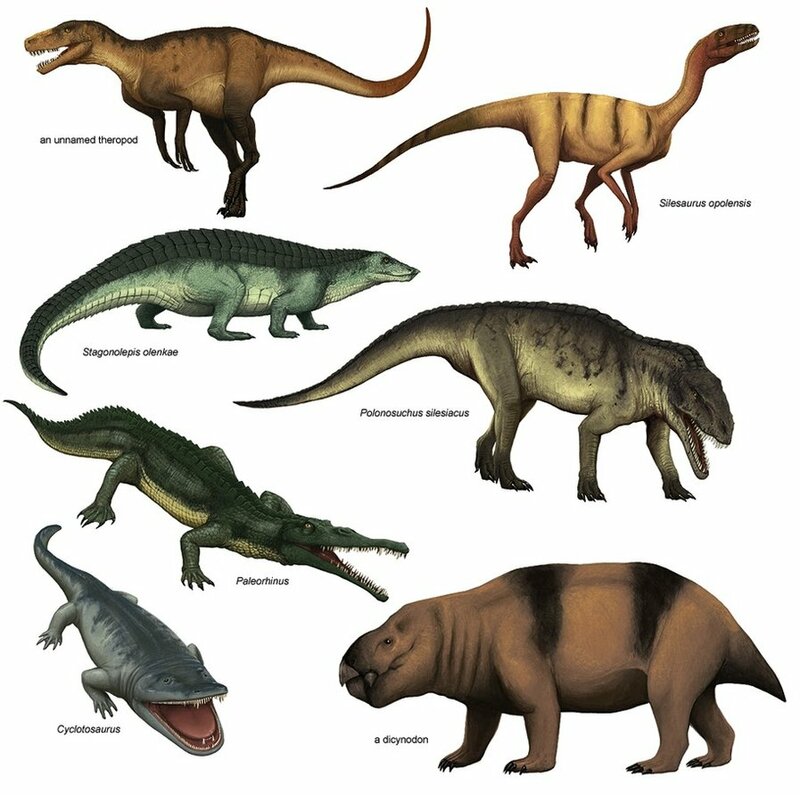 The authors also ran a phylogenetic analysis (an analysis of evolutionary relationships) and found that Teleocrater belongs to a small group of early avemetatarsalians, now called Aphanosauria, and is one of the earliest members of this group. This study provides much needed information about these early animals, and shows that the diversity of this group was much higher in the Triassic than previously thought.